The JEA board of directors Tuesday selected Minneapolis-based Ryan Companies US Inc. for negotiations to build a new campus, according to our Jacksonville Daily Record news partner. Ryan Companies proposes a nine-story office tower at 325 W. Adams St., a vacant, city-owned parcel near the Duval County Courthouse. JEA chose the Adams Street property over two other sites – one on the Southbank near the Kings Avenue Skyway station proposed by developer Mike Balanky and one on the Northbank at Lot J next to TIAA Bank Field proposed by Jacksonville Jaguars owner Shad Khan through Iguana Investments Florida LLC. 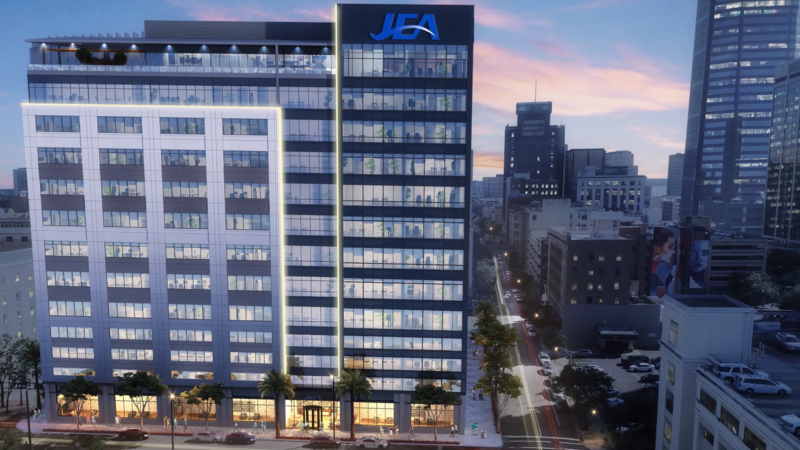 JEA will move from its headquarters at 21 W. Church St., where it has operated since 1988. Only four of the seven members of the JEA board voted Tuesday. Kelly Flanagan abstained because she is the Jaguars chief financial officer, John Campion missed the vote because of illness and one seat is vacant. Alan Howard, April Green, Camille Lee-Johnson and the Rev. Frederick Newbill unanimously supported the Adams Street project. “The board of JEA didn’t walk into this with any assumptions,” Howard said after the meeting. The JEA board ranked the Lot J proposal second, followed by the Southbank proposal. JEA will remain Downtown after selecting a site near the Duval County Courthouse. Ryan Companies seeks to purchase the land from the City of Jacksonville, a process that will require approval from the Downtown Investment Authority. The DIA will need to advertise a sale of the property through a request for proposals, allowing other bidders to make offers. No timeline is set for that. Douglas Dieck, Ryan Companies regional president, said he’s confident his group will secure the land. Dieck said the financial package offered to JEA includes $3.3 million for land acquisition. Ryan Companies estimates the total cost of the project at about $72.2 million, paid for by cash and debt secured by Ryan from Wells Fargo. The development would combine the customer service center and the corporate offices into a 207,810-square-foot tower, with an attached 850-space parking garage. The total rentable square footage comprises 195,426 square feet. Ryan seeks $32.97 per rentable square foot from JEA for 15 years with the first year’s lease costing $6.4 million. Those costs increase by 2.5 percent each year after. According to CBRE, which is spearheading the relocation effort for JEA, the average annual occupancy costs are $9.3 million. Total pretax occupancy costs for JEA would be about $139.5 million over 15 years. The project is expected to take 25-27 months to complete. JEA now enters a 120-day negotiation period to begin finalizing a lease agreement with Ryan. The company is expected to buy the property from the city during that time. According to an initial timeline, work could begin by September with construction running through October 2021. JEA could begin occupying the space by that November. The JEA board used a 760-point scoring method to rank the three proposals. The scores included up to 400 points for each proposal’s qualitative programming, comprising elements like workforce and customer engagement, economic development, timing and site control, development schedule and building programming. Another 200 points were available for quantitative factors, like the total or annualized cost to JEA, and the long-term financial burden. Each proposal was eligible to receive up to 60 points for the quality of presentations made in February to the JEA board. Finally, up to 100 points were to be awarded by the board of directors after Tuesday's evaluation, the total of which would be the average of the four board directors’ scores. Ryan Companies scored 585.75 points, followed by Lot J with 568.25 and the Kings Avenue Station bid with 534.35. Howard said the main difference between the three development companies was Ryan's attention to detail since February. He said Ryan's team acted swiftly during a 30-day negotiation window, offering concessions to JEA and returning revisions quickly. To him, Howard said, Ryan was “head and shoulders above everyone else,” when it came to negotiations. “That’s what put it over the top for me,” he said.